We Cheer 2 heightens the realistic, competitive cheerleading experience by immersing players in a nationwide cheerleading championship setting. Utilizing the Wii Remotes as virtual pom-poms, players follow on-screen prompts for choreographed routines that utilize a full range of arm and body movements. 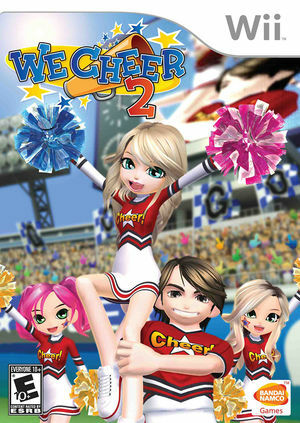 In addition to an all new licensed soundtrack of 30 songs, We Cheer 2 raises the bar with more options than ever before including challenging new dance moves, new stages, gameplay modes for up to four players, and limitless customization options for a huge roster of both female and male characters. With its simple yet addictive gameplay, players will lose themselves in the music and moves as they perfect the routines and earn top spot as captain of the squad. Typing in this game can be difficult without letters. Turn off Store EFB Copies to Texture Only to fix. The graph below charts the compatibility with We Cheer 2 since Dolphin's 2.0 release, listing revisions only where a compatibility change occurred. This page was last edited on 13 January 2018, at 15:28.